NASHVILLE, Tenn. — Before they became Sabres broadcasters, Rob Ray and Brad May played on one of the most competitive teams in Buffalo’s sporting history. Dubbed “The Hardest-Working Team in Hockey” during the mid-1990s, players pushed each other to be better on a daily basis. As this edition of the Sabres heads into tonight’s game in Nashville with nine losses in 10 games, folks are wondering if the players know they’re supposed to compete for victories and future employment. The players say they understand, but they’ve had a funny way of showing it. An inability to score combined with a penchant for foolish decisions has made a future in the NHL hazy for many. Buffalo has 12 players who will be free agents this summer, and it’s unlikely many general managers will flock toward people who failed to stand out on the worst team in the league. “You play for your career each and every night,” right wing Matt D’Agostini, a waiver claim who will be an unrestricted free agent, said in Bridgestone Arena. “You want a job for next year, especially when you’re in my situation. I’ve kind of been on the brink the last couple years. D’Agostini and fellow forward Cory Conacher drew Nolan’s ire Tuesday in Montreal for taking bad penalties. It prompted the coach to say players are indeed competing for future employment. In addition to D’Agostini, Zenon Konopka, John Scott, Alexander Sulzer and Henrik Tallinder will be unrestricted free agents. Conacher, Tyler Ennis, Marcus Foligno, Jamie McBain, Chad Ruhwedel, Nicolas Deslauriers and Matt Hackett are set to be restricted free agents. The last Sabres team to resemble this one was in 2002-03 edition. Buffalo finished 26th overall, and players such as Radoslav Hecl, Sean McMorrow and Jaroslav Kristek were never seen in the NHL again. Norm Milley, Jason Botterill and Milan Bartovic followed them out the door a short time later. The arrival of a new general manager should increase the uneasiness for the Sabres’ underachievers. Tim Murray isn’t beholden to any of them, and he joined the team in Music City to watch the game against the Predators. 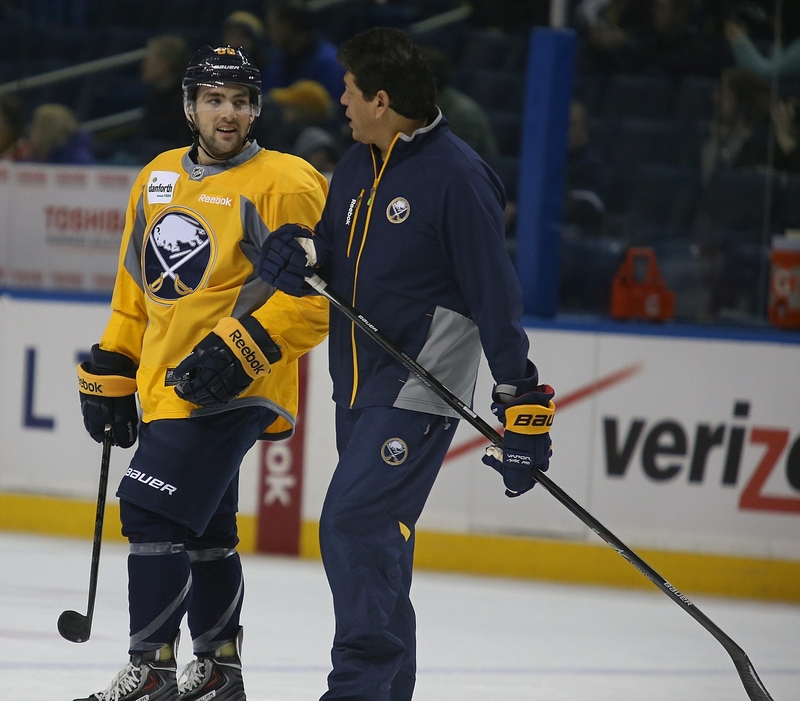 “It’s a rebuilding time here in Buffalo,” D’Agostini said, “and obviously with the record it’s going to be a major shake-up, new guys coming in, some guys going out. That’s just the way it is when a team isn’t successful.